A successful recruitment is the end result of a substantial process of construction in what is a complex world. We visit you and spend time with you to engage in a process of co-construction in which we absorb your culture and achieve a 360° level of understanding. An overall assessment of the candidate is essential in the complex world of corporate structure in which interdependence is key to success. We have the necessary detachment and experience to accept the risk of selection in agreement with our clients. Supporting our clients, organisations and candidates beyond the stage of recruitment to ensure successful, long-term integration. To ensure reliable decision-making and provide you with a clear and objective overview. 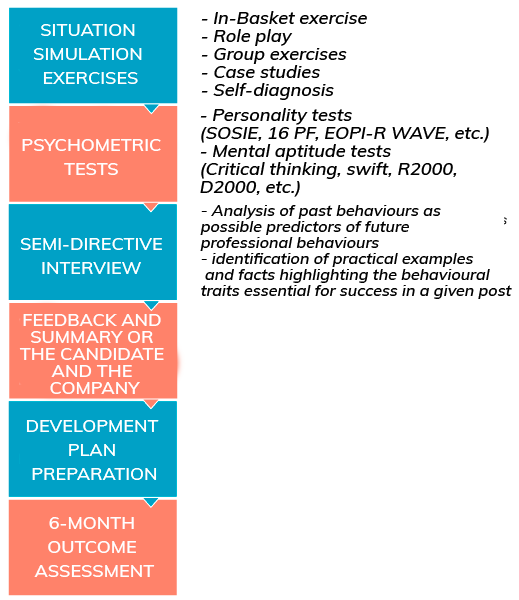 This service necessarily includes situation simulation and role-play exercises, as well as structured interviewing, personality profiling and psychometric testing. Where group assessments are conducted, they include group exercises (with or without allocated roles), individual situation simulation exercises, cognitive tests and personality tests. A powerful lever for delivering long-term organizational change by applying a pragmatic and innovative approach. We help senior management teams to play their full role as cognitive architects, which involves disseminating benchmarks, practices and values that ensure long-term structural coherence. It’s actually much more than a management issue; it’s about effective day-to-day guidance of skills. We have designed a new dynamic and modular approach to job descriptions. It’s all about updating real work. We have built and tested a simple, realistic job and skills forecasting management system based on five strong and structurally important priorities. We support you in safeguarding your core businesses and passing on the key knowledge needed for their continuity.